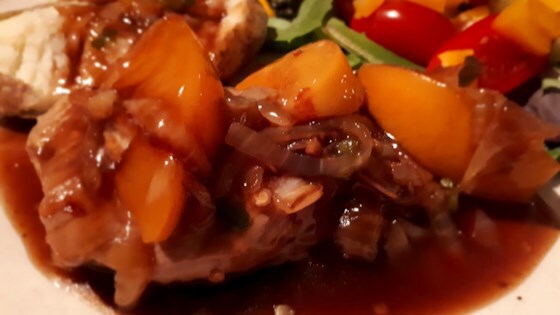 "This recipe combines spicy chili peppers and sweet peaches to make delectable pork chops in the microwave." Rub chili peppers into pork chops; cover and refrigerate for 30 minutes. In a microwave safe casserole dish, arrange chops in a single layer. Microwave on High for 5 minutes. In a measuring cup, mix together peach juice, brown sugar, salt, and soy sauce; pour over chops. Microwave on Medium for 4 minutes. Transfer chops to another dish, and cover. We weren't wild about this recipe either. Not sure what it was missing, but it was missing a zing. Maybe the canned peaches are a bit bland for a balanced flavor. I didn't really like this recipe. It just wasn't the right combination of flavors. I also wanted the sauce to make some kind of syrupy gravy, but it never did, no matter how much flour.